Hubby and I have enjoyed our first week of the vegetarian lifestyle. We both feel healthier and more aware of what we are putting into our bodies. I am amazed at the hightened energy level - without the meat. I am curious how my other bloggers and bloggistas are faring with their New Years resolutions. Arrange them in a baking dish that has a thin layer of spaghetti sauce on the bottom. Cover the eggplant with a thin layer of additional sauce. Sprinkle the entire pan with a liberal amount of shredded mozzarella cheese. Sprinkle some oregano, basil, and grated parmigiana cheese. top with parmesan cheese. ENJOY. peel the sweet potatoes, cut in quarters, then into thin slices. Cook or steam potatoes on the stovetop. Combine the marinade mixture and add the sweet potatoes to the marinade while they are still hot. Cool the broccoli off by running cool water over the spears. place broccoli on top of marinatd sweet potatoes, cover tightly and marinate for several hours. Mix broccoli into the sweet potates just before serving. Please make our friend "LimaRuss" feel welcome in blogland!!!!! As mentioned many times, Kari and I have been very blessed to meet and run with some pretty amazing people this year. LimaRuss has become a fixture on our blog, and is now a great running friend to many. When I asked him to write his story for our blog, it didn't go over as well as I had hoped. Like many of us, he doesn't like to pat himself on the back, or publicize that which makes him so great. Finally, with the help of his equally wonderful wife, Melissa, he has sent us his "story." He wanted me to post it in installments, but it is something that should be read in one sitting. I'm sure there is nothing in his story that isn't foreign to many of you - it is kind of what brings us all together. And without further ado - here is Russ. 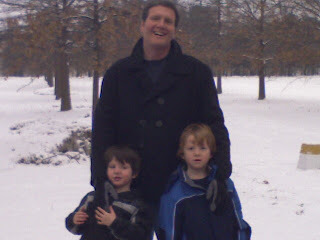 Just before Christmas of 2007 I weighed 258-260 pounds. My combined cholesterol was 258 and my triglycerides were 110. This was the wakeup call! These numbers were the result of living large while traveling for my job. I travel with large teams of people so this means lots of group dinners. Let’s just say that I took full advantage of this. It was so much fun! I was soon called “DC” (Dinner Coordinator) by my coworkers because I took on the job of coordinating our little outings when on the road. I have always been heavy and weighed around 240 most of my married life. People always said I carried the weight well! Well, I decided not to carry it anymore. Right after the first of the year I started walking. I walked around the block to start. Eventually I was walking through town and out on the country roads. I worked up to doing 5 mile walks. I started watching my diet. Gave up all fried foods, potatoes and limited myself to wheat bread only. I drank wine instead of beer. I stopped eating off my kid’s plates. By June I had lost almost 25 lbs. The walking was great and it was working. However, it was taking too long to get the distance and pretty boring on the tread mill. All this time I was walking, my wife Melissa and my neighbor, Judi, were running. They would start with me and then off they would run and I would continue to walk. One day in July they walked with me as usual and then started running. I got the urge to run, so I followed behind them for my first attempt at running. They were doing a 2 miler that day. I remember this because I actually did pretty well. I ran all but maybe a ¼ of a mile. Not bad for the first attempt. I have been running since that day. I did not know anything about running, I just went out and ran. I did the 2 mile route for a number of weeks. I slowly worked to running 3 miles and decided to run my first 5k. 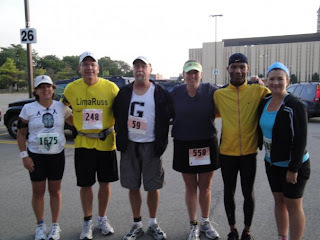 On Sept 28th 2008 I ran the Buchanan Brothers memorial 5k race. I ran the race in 30:02 which was better than I expected. 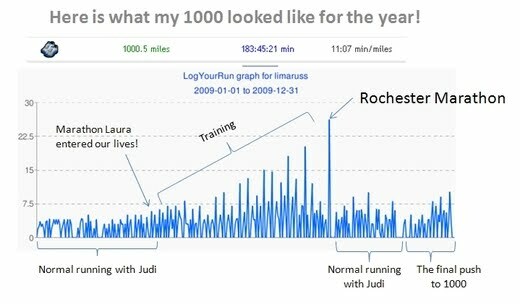 Not sure when I got “The bug” but it was probably when I decided to run the Lilac 10 with Judi. We needed a goal and this race was it. While training for this, we agreed to run the Rochester Half Marathon in Sept. 2009. (This was about the time I met Laura.) She visited our Lima Rotary Club to share the Road to Paris story. I did not know that evening how my journey would change. 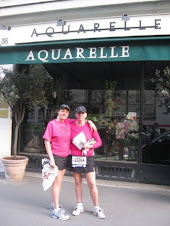 I started to follow the journey of Laura and Kari and the Road to Paris. I rebuilt my training plan for the full marathon and continued to train though the summer hitting the ups and downs of training. Melissa had to pick me up on my 16 miler when I hit the wall at 14. I continued to train with Judi. We planned our routes so we finished our long runs together. Laura came out and did a 7 miler with Judi and me. It was awesome because she did something that Judi and I never did (up until then). She ran alongside Judi and I, allowing us to talk the whole time we ran. Before this run with Laura, Judi and I used to take turns following each other. Now we run side by side on every run. I like to call it the Laura effect. At the time, I had no idea how big the running network was. I have met some really great people along the way. My family, daily mile friends, Facebook friends have all played a role in keeping me motivated through this. I think I have actually motivated a number of people to either run or set a bigger goal. Finally, race day. I got up at 5 am to shower for the initial wake up as they say it warms the muscles and had I the usual pre-run coffee. 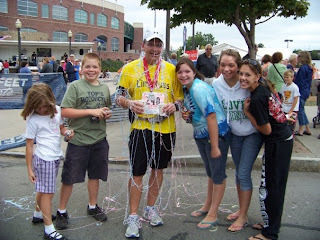 We headed to Frontier Field to get our timing chip and mingle with the other runners. Judi and her husbnad, Mark, followed in the motor home which would serve as base camp for the spectators and the runners. Mark kept us all happy with drinks, breakfast sandwiches and a private bathroom! Our running group slowly gathered around the camper as we awaited the start. We even met the eventual winner of the marathon (Derrick Jones) as he jogged by doing his warm up. Of course it was Marathon Laura who introduced us to Derrick. The race started at 7:30. I told myself all through the training that I would run my race and not let the crowd push me along. I did not have Judi with me to talk me through the run, which turned out to be an issue. I started out at a faster pace than I had planned for the first couple of miles. Thought I would settle down as I warmed up. I hit the downhill on East Ave and was still keeping with the crowd around me and once again at a faster pace than planned. We hit the canal in Fairport headed back to the city. Up to this point I felt strong but was glad to see some of my family at Schoen Place waiting to root me along. The kids came down the path and ran a short way with me. It was a nice to have them there. My mother in-law offered me a banana and a water bottle. (Looking back I should have taken the banana.) I ran the first 17 miles without walking. I wanted to do the entire run without walking since this is what I trained for. All along I was drinking my water and eating the beans as planned (at least that is what I thought). After mile 17 I decided to walk through the water stations. I felt my first hint of cramping around mile 18 but stopped and stretched through it and continued to run. I continued on and Miss and Judi and the rest of the clan were there to route me on at mile 19. Another pick me up that I really needed at that point. I continued on down the path knowing that I would see my cheering section again near U of R. At mile 20 the cramping got worse. It first I thought I could run through it. I walked and stretched from 20.5 to almost 22.5 when I felt I could run again. After mile 23 Melissa took to the trail with me to help me get to the end. They were waiting at the U of R spectator location. The cheering helped but I needed the extra support running with me. I walked a few more times before the Ford Street bridge turn but after that I had lost the cramping but was running on stiff legs and collapsing in the mid section. I managed a decent pace to the end with my arms pumping to move me along. I remember crossing the Ford Street Bridge and Melissa telling me to look to the right to see the view of the city. I looked left and she corrected me. They say the last six miles is all mental. I guess so. Miss ran with me until we saw Judi and Colleen just before the turn to the finish. I was on my own and found new energy as I turned the corner and saw the finish line. I finished as strong as I could at that point and completed the goal that I set out to do. I finished my first Marathon! Yes, 26.2 miles! Everyone was waiting for me at the finish after 5 hours and 38 minutes. The kids were laying in wait with cans of silly string to attack me. It was great. We all headed our own directions to shower, ice and sleep. Later that afternoon we all met up again at our house to celebrate our victories. Mark did the cooking! 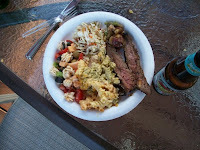 With all the other dishes we had plenty of food and beer. The food was so good Laura took pictures! I really like this running thing. This one is easy- just mix everything together, let it sit for 24 hours, grab some tortilla chips or other favorite dredging device. I'm adding avacados upon serving. Yummo!! This a favorite "go-to-recipe" of my mom's. She served it at Christmas Eve get-together and even my kids loved it. Mix the following together and pour over the cabbage salad. Toss it all together and enjoy!!! saute chopped asparagus and onions in melted butter and salt for about 10 minutes. Sprinke 2 tbsp flour while stirring constantly over low heat. (5-8 minutes) Add water, stirring constantly and bring to a boil. Bring to a simmer for about 5 minutes. Add remaining flour and cook for another 10 minutes. Puree the soup with the milk and season with dill, tarragon, and white pepper. I bought some great cilantro/black bean veggie burgers that we tried last night on whole wheat rolls, vegan mayo, onion....they were great. I'm going to try the new Acai smoothie packets that I bought with some frozen berries and bananas - just to see how they go. Doesn't have the same ring to it as the Albany one, but it was the best I could do. There was NO WAY I could have done it yesterday since Sweetie and I were out til the wee ones (5:30! Felt like a college student) and then slept til 2pm (which was awesome)-- so much for team spirit. But I found it today. I planned on spending the entire day in bed reading but I managed to get up and get motivated. 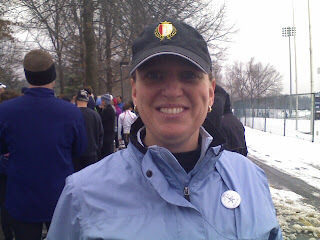 My inspirations were: Laura (I had to get my halfie in and looks like more rain tomorrow), Ms. Fool (Happy second Blogday), Running Laur, and the Dirt Diva (Laura did you notice she's mentioned in Born to Run? ), who makes me feel really bad for complaining about my tiny runs when she's gearing up for her 100-mile races, which seem to happen something like every other week. Bowerm's tweets made me long for BBQ at about the 11-mile mark. I tried to get as close to Laura's time but I pooped out at 2:17 and was too close to home to do anything else but go there. I just checked though, and I did make it to 13.1 in the rain. P.s. How do you like the awesome view from my balcony? Doesn't it make you want to move to Italy?? Comment from Laura - Do we have the BEST team blog, or what??? I mean, look at her - out there running with us in mind!!! I sense GREAT things for 2010. Per usual, last week brought a nice sinus infection and a series of migraines that made me feel right at home. I can't remember a race that I've been 100%, so this one was no exception. 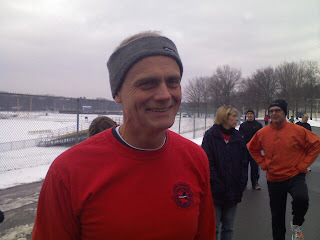 My father-in-law had decided to run with us quite a few months ago. When we arrived in the area two days before the race, he attempted to talk his way out of it (claiming he was sick with a horrible cold.) I threw the gauntlet down as fast as you can say...... well, pretty fast. NO WAY, sir, THERE WILL BE NO USING THAT CARD ON ME - you're running this race. He did! We met Mary Karen at 11am for registration. The ambiance of this pre-race locale was great - a fantastic way to start the year. I plopped my $5 registration on the desk and managed a quick visit with my kids and husband before making the way to the start. 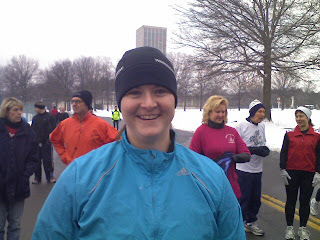 Mary Karen looking so happy at the start - isn't she cute? In the end, the memorable moment of this race will be the inner strength that Mary Karen found when she hit the wall at mile 11.5. She impressed me with her determination.These are the moments that people miss when they run alone - they are ot lost on me. I loved that I had the chance to run this event with her and my father-in-law.....good stuff. Got home a few hours ago and got to work on my next half-marathon plans. (Williamsburg, VA on February 28th) Keeping with my goal to run with as many friends as possible, I was elated to find out that my very dear friend Francine and her daughter Bailey (residents of Williamsburg) will be running their first half-marathon with me.....can you say PSYCHED???? Happy New Year - and be sure to get out there and run.